Borsalino is among the most widely known hat-producing trademarks. It has a rich history that dates back to 1857. The name of the trademark is synonymous to a well-known fedora style that is peculiar to the hats of previous centuries. The products of Borsalino company have a number of features characteristic of the traditional fedora style of headwear. The Borsalino Company is well-known not only in its country of origin, Italy, but in many other countries of the world: EU, USA, Latin America, Asia. The company has recently opened a kids’ headwear collection that bristles with caps and hats of different styles and shapes. The kids’ hats by Borsalino are made from the most delicate and high-quality fabrics that you would ever find in today’s market. The styles of the trademark are a bit sophisticated, which brings a new look to the appearance of children wearing the brand’s hats. The collection of hats and caps is oriented on little babies and older kids. The sizes are really diverse, so baby and kids hats produced by the Borsalino company will fit children of different age. Borsalino designers have created a fantastic range of hats and caps for children made from authentic rabbit fur and felt. The entire process of production takes place in the Italian region, Alessandria. The brand’s history goes back to the times when the founder of the company, Giuseppe Borsalino, visited France in order to learn more about the production of hats. When Borsalino returned to Italy, he decided to open his own hat-producing company that would specialize in the manufacturing felt hats. When the founder of the company died, the factory was passed to the son of Giuseppe Borsalino. Unfortunately, the factory under the guidance of the founder’s son did not have as much success as in previous years. Today, the trademark Borsalino produces a significant range of products that includes clothes, hats (as well as baby and children hats) and a variety of accessories. The company’s aim is to maintain the beauty and charm of the fashion peculiar to the previous century. Borsalino has several branches in the European countries and the United States. The trademark has expanded its variety of products and today, it even manufactures helmets for those who are fascinated with motorbike rides. 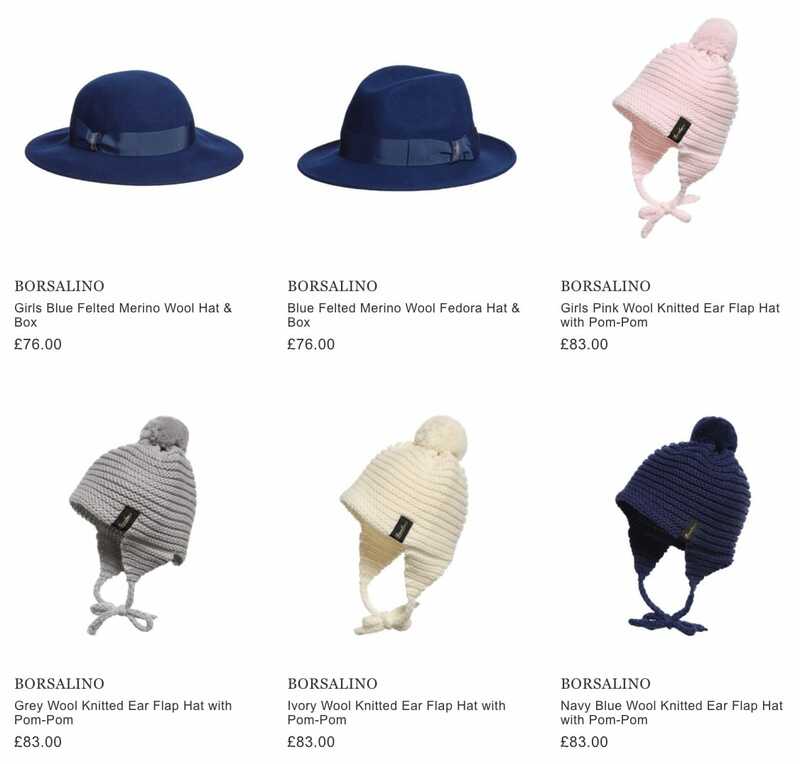 Borsalino is greatly successful especially owing the fabulous range of children’s headwear intended for kids of different age groups (babies, toddlers, infants, teenagers). As for the children’s collection of Borsalino, the hats and caps manufactured by the brand are all handmade from durable and top-quality fabrics that continue to be a pleasant surprise for parents and their kids due to their functionality and durability. The goods offered by the brand represent a fantastic range of comfortable and fashionable hats that will make your child look cute and charming. Every parent wants to ensure that their kids wear hats made from authentic fabrics. Borsalino headwear definitely belongs to this category. The caps and hats for little babies and young children are made from only authentic fabric that is soft and delicate against the skin of children. Kids headwear by Borsalino are available in a variety of color combinations. You are welcome to choose the suitable color matching the outfit of your child or the one that you like most. Borsalino products are especially designed for boys and girls alike. Borsalino hats and caps are must-have items in every child’s wardrobe. Such headwear is extremely comfortable and will make your little kid look cute and fashionable. Nowadays, Borsalino continues to be a number-one option when it comes to choosing headwear for kids. It is now popular not only in Europe, but in other parts of the world as well. Borsalino is a leading company in the sphere of kids’ hat production and is sure to remain such for a long time to come.